Most people who have used LoopBack know that it is a highly-extensible, open-source Node.js framework that enables you to quickly create dynamic end-to-end REST APIs with little or no coding. These REST APIs can be used by client applications (Web/Mobile/IoT/Other) to perform CRUD + Custom operations on any 3rd party application for which there is a LoopBack connector. Irrespective of the nature of the APIs/Client libraries exposed by the 3rd party application, the client has standard, simple and runtime agnostic REST APIs to perform actions on the application. That is the value proposition of LoopBack. Now let’s consider the other side of the story: where an event occurs in a 3rd party application (ex. a record got created / updated / deleted). Different applications may expose these events through different mechanisms (Webhooks, Streaming, Polling API, Websockets, PubSub, PubSubHubbub, other). But what if client applications want to consume these events in a standard, simple and runtime agnostic way? Is that possible with LoopBack? Can we use the same LoopBack programming constructs of datasources, models and connectors for the events side of the story? It turns out that with a little work, it can be done and this post shows how. Message Broker A hub to which the events can be published by the LoopBack application and from where consumers can receive messages through subscription. Example of common brokers are MQTT (mosquitto), Apache Kafka, AMQP (Rabbit), Redis pub/sub and many more. Event Connector A plugin component for the LoopBack application which implements interfaces specific to events. This is analogous to the LoopBack CRUD connectors which implements the PersistedModel APIs. We have a connector implemented for each 3rd party application that we want to consume events from. Example connectors could be connector for Cloudant, DB2, DashDB, MySQL and many more. 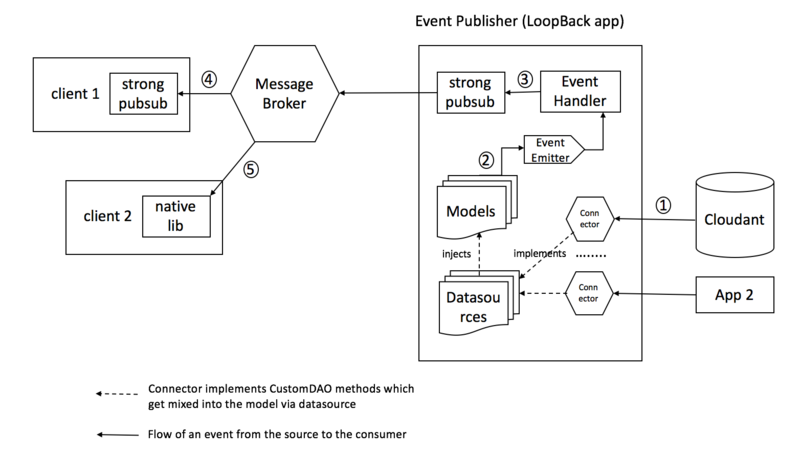 Event Publisher A LoopBack app in which datasources and models can be created using the standard LoopBack APIs. The datasources are bound to Event Connectors. As an example, the datasource will have the Cloudant credentials and the model will identify the Cloudant collection for which I want the (CREATED/UPDATED/DELETED) events. The diagram below shows end to end view of the solution. Let’s look at each piece of the solution in greater detail. start() method uses the application specific APIs to retrieve events and uses the Event Emitter passed in the input argument to send this event to the LoopBack app. stop() methods stops retrieving events from the application. Note that the initialize() method of the connector is the same as in CRUD connectors and initializes the connection credentials to communicate with the application. Another thing to mention here is that the Event Interface is defined as a CustomDAO in the post but it is possible to have it standardized (post review, changes and approval) as a part of the LoopBack framework the way SQLConnector/PersistedModel is. If that happens, then a CustomDAO would not be needed. The datasource points to my Cloudant instance and a model is created for the accounts collection in it. On receiving events from connector for document creation/updation/deletion in accounts collection, the handler publishes message to a topic (/v1/subutest) using the strong-pubsub client. For demonstration purposes, we have run a MQTT broker (mosquitto) on the localhost at port 1883. The client application is a simple Node.js app which runs the code below (borrowed from strong-pubsub documentation). It connects to the MQTT broker using strong-pubsub client and adapter and subscribes for messages in the /v1/subutest topic. When it receives a message, it logs it to console. 1493572785: Opening ipv4 listen socket on port 1883. 1493572785: Opening ipv6 listen socket on port 1883. Note: To make things more interesting we start another non Node.js consumer listening to the same topic. Check the broker logs shows that 2 clients have connected to it. 1493572839: New connection from 127.0.0.1 on port 1883. 1493572839: New client connected from 127.0.0.1 as mqttjs_8dfcc98e (c1, k10). 1493572943: New connection from ::1 on port 1883. 1493572943: New client connected from ::1 as mosqsub/1718-Subramania (c1, k60). 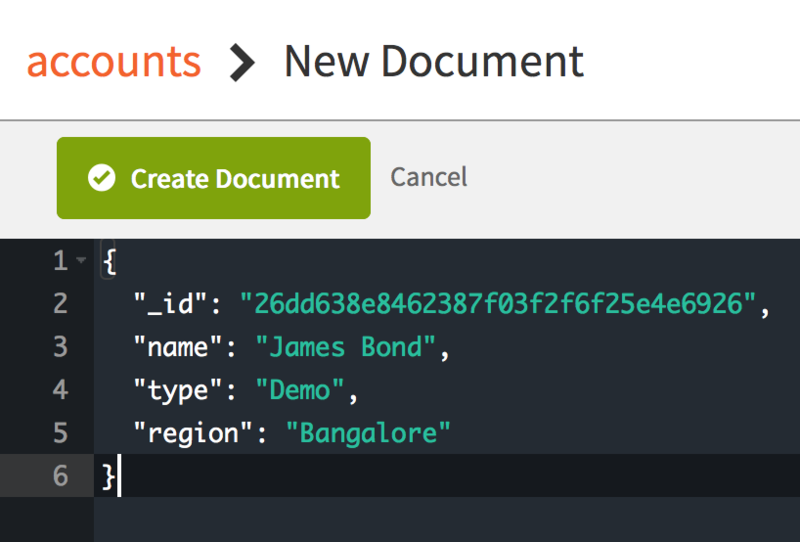 Run the Event Publisher LoopBack app. Log in to Cloudant and create a new document in accounts collection. 1493573959: New connection from 127.0.0.1 on port 1883. 1493573959: New client connected from 127.0.0.1 as mqttjs_e1b485ee (c1, k10). Generic - Using strong-pubsub abstracts away broker specific interfaces. Modular - A pluggable event connector for every application we want events from. Consistent - Same conceptual and programming model (datasources and models) as for the CRUD side. Read about planned changes to LoopBack.